Mischief La Bas as the Elvis Cleaning Company - Neil Drover - agency for live music, presenters and entertainers. 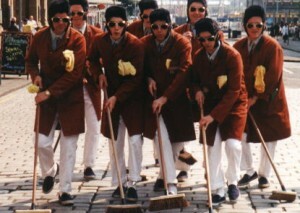 The Elvis Cleaning Company from the creative Mischief La Bas. Highly efficient and dedicated, the Memphis Crew spread the word… “Cleanliness is next to Pressliness”!” great fun through dinner as the Elvis team sweep up singing as they go. They know all the songs !